‘Pyramids of Mars’ is widely regarded as a truly classic serial, combining two leads on absolutely top form, a credible alien menace threatening to destroy the entire world, an underlying sense of horror and intrigue, and use of the BBC’s strong period set design. Perhaps more impressive than its lasting legacy, though, is the fact that it had to undergo several rewrites to finally become what eventually aired, writer Robert Holmes deftly stepping in when needed to fix what was deemed a broken script. ‘Pyramids of Mars’ opens up and explores several plot developments during its running time, certainly avoiding the classic padding pitfall of many Doctor Who adventures by doing so in the process. Thus, as events unfold about the house of Lord Scarman, the introduction and subsequent deaths of cultist Narmin and Doctor Warlock as well as the introduction of the force field around the property provide interesting avenues for the plot without necessarily delivering maximum impact, but they certainly keep events from becoming stale. This is perhaps most apparent in the final episode when, with Sutekh admittedly trapped on Mars, the Doctor inexplicably gets wrapped up in a series of logic puzzles. Fortunately, Robert Holmes avoids creating the sensation that too many disparate aspects are being thrown at viewers, instead creating a wonderful sense of danger and unease as so many fatal events happen in short measure to characters seemingly built up to be big players. Despite the incredible severity of the threat that Sutekh poses, ‘Pyramids of Mars’ is likewise unafraid to maintain a sense of fun, even taking the time to point out how historically inaccurate the priesthole in the mansion that the Doctor uses to escape is. This contrast with the brash, pure evil that Sutekh’s blunt and straightforward demeanour intimates works immensely well. He offers no explanation for his actions other than that he is pure evil incarnate, and his immense visual appearance and ability to terrify the Doctor from a planet away highlight just how dangerous this foe truly is. Ancient Egypt has long been a fascination of historians and popular culture alike, and it’s rather surprising that Egyptology took so long to manifest within the realms of Doctor Who. Unsurprisingly, the gods and mythology of Egypt are given a science fiction twist, giving yet another interpretation of the famed hypotheses in Chariot of the Gods?, the 1968 Erich Von Daniken novel that suggested that ancient Earth had been visited by advanced aliens. 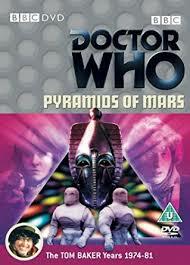 In ‘Pyramids of Mars,’ the Egyptian mythology was formed as an attempt by humans to understand the war of the gods above them in what the Doctor terms the Osiran pattern after Sutekh’s race. This also again brings to the forefront the Doctor’s own alien nature and the eternity in which he walks, and the Fourth Doctor’s continuing distancing from the more pro-Establishment Third Doctor continues to immense effect as he again delights in not having to follow around the Brigadier while also treating time as a more pliable essence than his previous incarnations thought. When he gets a glimpse of an alternate 1980 in which the world is a barren wasteland due to the destruction by Sutekh, he is more angered by Sutekh’s triumph and the loss of life that entails than by the fact that the timeline has been corrupted, an interesting twist on a character who has held the integrity of the timeline above all else previously. ‘Pyramids of Mars’ is able to overcome the fact that it was salvaged from a lesser script admirably, creating a wonderful atmosphere and threat in the process. With the new dynamic of the Fourth Doctor and Sarah Jane Smith firing on all cylinders with a true sense of fun and companionship, this is a serial that becomes much stronger than its component parts to create a unique and lasting serial that is certainly a highlight of the early Tom Baker era.